Today, I arrived back in the gem-jewelry-rock-bead-mineral-etc. paradise that is Tucson this time of year! 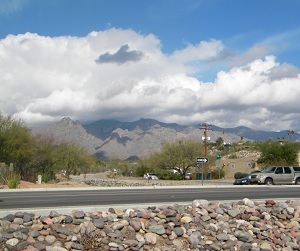 I'll be tweeting (follow us @JewelMakinDaily), Facebooking, and blogging (on this page) all my favorite finds and experiences live from Tucson the rest of the week, so don't miss out! February 5 2014: American Gem Trade Association (AGTA) Show, aka "The Big One"
This and the Gem & Jeweler's Exchange (GJX) show across the street are where I usually buy all my single pearls for my collection. 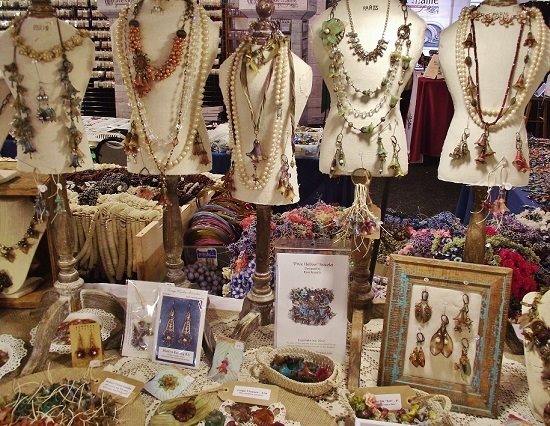 There's plenty of pearl strands and jewelry to be found there, too, along with tons of fine faceted and cabochon gemstones, high-end and fashion jewelry, and a few oddities as well. A gem buyer friend of mine bought a bag of the greenest peridot rough (Pakistani) I've ever seen today. Can't wait to see some of it cut! At AGTA today, I enjoyed visiting one of my fave vendors for natural and collectible pearls, American Pearl Co.! 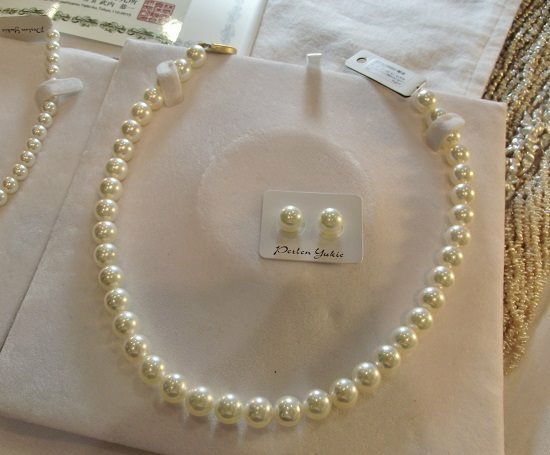 I just cherry-picked through this mouth-watering pile of what would have formerly been called "keshi" pearls to find my latest unique pearl treasures. Remember the cool mermaid-shaped pearl from my pearl collection? This is where I found it last year. Treasure hunting like this is almost as fun as actually harvesting the pearls! I said "formerly keshi" above because CIBJO rules indicate that bonus pearls that are a non-nucleated by-product of culturing (which is what keshi meant) can only be called keshi if they're saltwater pearls. 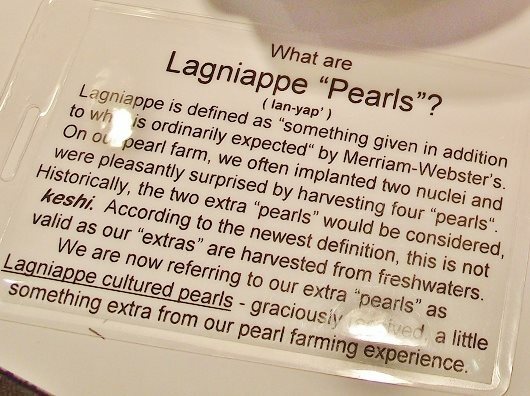 These are freshwater, so the American Pearl folks made up their own name for them: lagniappe pearls. Now living in Louisiana, you know that caught my eye! 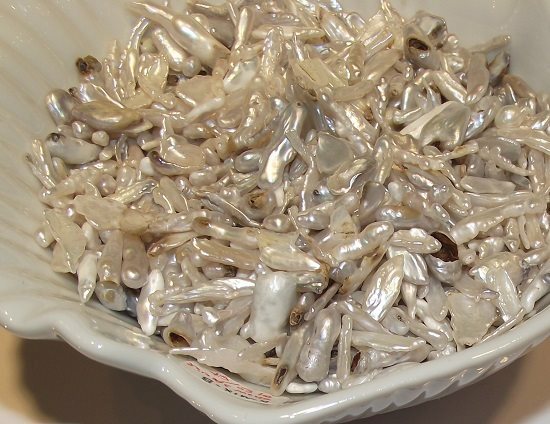 While I was looking through the bowl above, a woman walked up and said, "Lagniappe pearls, hm. You know that means they're supposed to be free, right?" One more bit of pearl eye candy before I sign out for the day: Check out these delicious, absolutely perfect and HUGE 10.5mm Akoya pearls! Oh my. I didn't make it to GJX today, and tomorrow I'll be at my favorite show, To Bead True Blue! Watch this space! What a busy day! The best part of it was meeting so many JMD readers. I can't tell you how much I appreciate you guys! Thanks for saying hello. 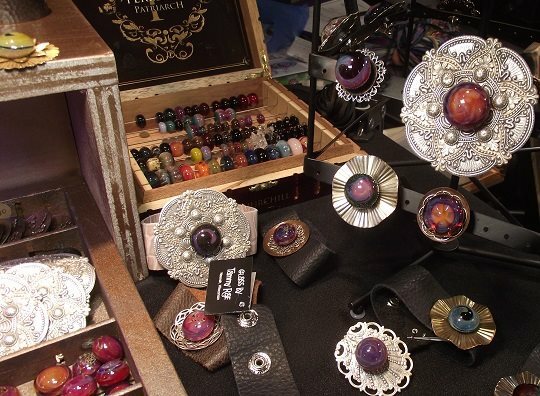 I spent all day at the To Bead True Blue show, which is always my favorite show in Tucson. There's a great blend of techniques and materials there (glass, enamel, wire, vintage), and of designers and talented people. Many of my favorites are there, too: Susan Lenart Kazmer and all the ICE Resin folks, Nunn Design, Lillypilly Designs, Wire Lace & Wire Luxe from Alacarte Clasps, Parawire, SilverSilk, Dakota Stones, Gail Crosman Moore, Echo Artworks, Green Girl Studios, Christi Friesen, Eleanore Macnish, Sandy Schor (found objects! vintage!) and. . . . I could go on and on! Eleanore Macnish's gorgeous lampwork glass beads. It always makes me happy just to see her and her booth. Gail Crossman Moore's new designs with feather-light paper clay. 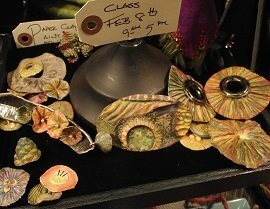 Check out her paper clay jewelry-making classes at Bead Fest and discover this fabulous product.! Awesome new slate sheets from Lillypilly Designs that you can cut with shears and heat until flexible. Can't wait to play with this and tell you more! 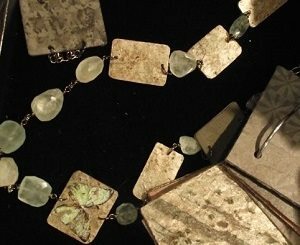 Beautiful jewelry from Becky Nunn and the talented designers at Nunn Design. The lovely Linda Hartung of Alacarte Clasps wearing a Wire Luxe necklace with a polymer clay focal design, by the amazing Christi Friesen. Polymer clay can be baked right on the Wire Luxe! I loved having a demo of the Funjig from Linda. Linda developed the jig to make the flowers but it's loaded with smart features for ease of use and success. 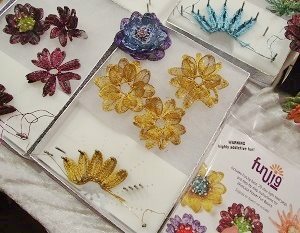 Can't wait to make some of these Wire Lace flowers! This year I met three new vendors who hadn't been here before who were all just my style: Glass Beads by Tammy Rae, Vintage Meadow Artworks, and the folks from Clover USA were there sharing products, kits, and free project sheets for felting and tatting–both of which I think are great additions to mixed-media jewelry. I loved their Hearts, Beads & Swirls felt cuff bracelet project. Tammy Rae (see her tucked in there behind the necklaces?) 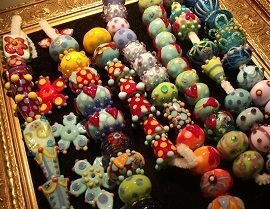 has gorgeous lampwork glass beads, and she has invented a clever technique that allows glass bead hoarders like me (and you?) to actually wear and enjoy our pretties. She builds the bead with a threaded core–then it can be screwed onto rings, brooches, pendant bases, etc., for gorgeous interchangeable artisan jewelry (below). Super cool, right? Plus her jewelry designs and those made by others using her glass beads were spectacular. Watch for more about her on JMD in the coming weeks. The Vintage Meadow Artworks booth was so full of flowers and lovely English-garden colors and piles and piles of pretty, I couldn't pass it by. In addition to acrylic flower beads, she had enameled keys, flowers, and other shapes in a really wonderful color palette and hand-dyed silk pieces that she was wrapping onto bangle bracelets. Discovering this booth (and its delightful inhabitants, designer Sara and owner Heather) helped make up for the absence of a favorite boothof vintage goods that wasn't here this year. Another favorite find this year (I don't know how I missed her last year), Diane Hawkey's colorful and awesome ceramic beads and pendants made me smile. 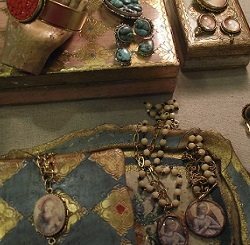 Love the colors, love the folk-style designs, love her jewelry design ideas. Love it all. Can't wait to make a bird-on-a-branch necklace similar to hers–I got all the components for it. You'll see more from Diane on JMD soon. 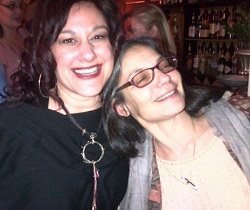 I ended the day with a refreshing and inspiring (as always) visit with Katie Hacker, host of Beads Baubles and Jewels and the busiest girl in all of jewelry making, in the Design Lounge. She gave me a tour of the work of several talented jewelry designers showcasing products from a variety of vendors, including Leather Cord, Garlan Chain, Dakota Stones, and others. She offered me water, oranges, and a chair to sit down for a few minutes (making her my new best friend at that point in the day), and we had a nice little visit. 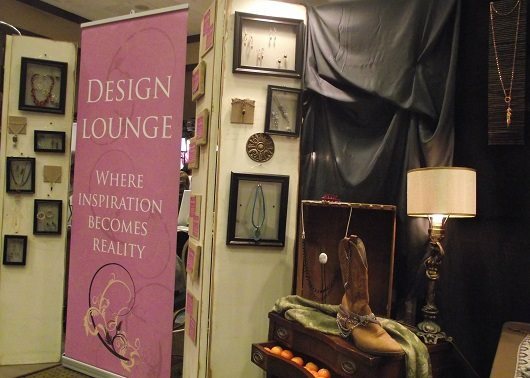 They have big plans for the Design Lounge to expand, and I'm so happy to see such a creative and collaborative effort grow–can't wait to see what it's like next year. 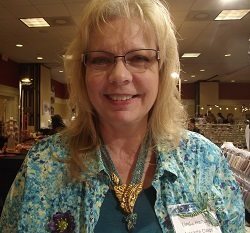 This also gave me a chance to catch up with Bonnie Ogilvie of Ogilvie Inc., a sweet friend whose family business has helped bring leather cording, all kinds of chain, gemstones, and other products from the above-mentioned vendors to market for us all to enjoy since 1973. 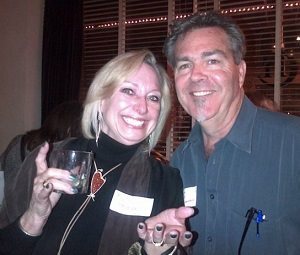 This day of super fun and inspiration ended with a bang: the annual Interweave party. I got to see my sweet dear friend Lexi Erickson; despite regular emails and phone calls, I hadn't seen her in person in THREE YEARS! I squealed and ran when I saw her. It was so nice to be around her again, even for just a few minutes. This is Lexi wearing her Lapidary Journal Jewelry Artist Jan/Feb cover piece with Jeff Fulkerson, host of the One Hour Bracelets video. It was great to meet him tonight. I also go to hang out with my Sparkle Sistah (and former coworker as Beading Daily editor) Kristal Wick, who works at ArtBeads now. We're like two peas in a pod and it takes only minutes for our level of sassiness to reach its norm. Love her! We're going to Kon Tiki Friday night for the pu-pu platter and fruity drinks served in coconuts with big umbrellas. Can't wait! At the party, I got to spend a few minutes with so many wonderful and creative people–awesome coworkers from the Colorado and Pennsylvania offices that I only get to see in Tucson, Kate Richbourg (whom I never seem to get to socialize with for even a minute–but we made it happen this year), and the fabulous ICE Resin team, including Susan and Jen Cushman but also Susan's sister Linda and her cool cute son, and their social media whiz Jennifer Priest–who had just done a social media webinar for Interweave. It's always great to see folks like Wyatt White from Beadalon, Nina of Nina Designs, and Sara from C-Koop Beads (check out her enameled mini book cover pendants! LOVE!) even if just for a quick hello. I arranged lots of upcoming guest designer blogs for Jewelry Making Daily at the party, so there are lots of fun things coming soon! 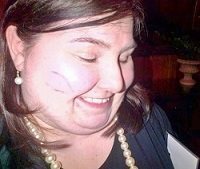 I left the party with a big fat lipstick smooch from Susan on my cheek. Now we're all tuckered out but looking forward to one last day in gem paradise tomorrow. I know I've forgotten to tell you something that I loved today–but it'll come to me eventually. And I still haven't decided where I'll go–the JOGS show, a couple of the smaller bead shows, GJX, a bunch of shows on the Strip? Decisions, decisions. I need another week in Tucson!